On December 2, 2011, the ICASP symposium “Making the Changes: Ethics and the Improvising Business” brought together leaders in the fields of cultural studies, management, ethnomusicology, business ethics, and music performance to address issues that emerge from the intersection of improvisation and business management. As the afternoon progressed, the presenters considered the symposium theme from a rich variety of perspectives. Keynote speaker R. Keith Sawyer, Professor of Education and Psychology at Washington University in St. Louis, participated in a plenary interview with ICASP Postdoctoral Research Fellow Mark Laver, discussing ways in which Sawyer’s work on an improvisatory approach to business management might also offer ways to break down the racialized and gendered power hierarchies that pervade in conventional management models. Alan Convery, National Manager of Community Relations at TD Bank, talked about his work with community arts organizations and other not-for-profits. He also described some the ways in which Canada’s largest bank has attempted to incorporate elements of improvisatory management structure, both by engaging local communities, and by attempting to make its own employees vocal participants in the bank’s corporate and charitable initiatives. Chris MacDonald, Visiting Scholar at the Clarkson Centre for Business Ethics and Board Effectiveness at the Rotman School of Management, University of Toronto, and Professor of Philosophy at St. Mary's University, explored how a corporation’s response to a crisis – such as emergent political turmoil, a plane crash, or hurricane – demonstrates the improvisatory essence of business ethics. Faced with an unexpected disaster, corporate stakeholders and spokespeople must quickly improvise an ethical response, relying simultaneously on extant structures (such as a statement of ethics or code of ethical conduct), and their own spontaneous reading of the situation. Improvisers Ken Aldcroft, Scott Thomson, and Pete Johnston collaboratively presented a challenging, impassioned, and polemical account of the politics and ethics of improvised music, reminding us that capitalist business practices of all stripes – especially those associated with real estate development and the financial sectors – have often had a deleterious impact on both the sites and the practices of avant-garde and subaltern cultural and artistic production. Moreover, they insisted that avant-garde improvised music is almost always necessarily anti-capitalist, standing as a musical critique of the capitalist ideologies of endlessly expanding production and profit. The final speaker of the afternoon was Nancy J. Adler, S. Bronfman Chair in Management at the Desautels Faculty of Management, McGill University. Dr. Adler’s talk “Leading Beautifully: The Serendipity Suite” sought to bridge the urgent political critique of improvised music and the comparatively conservative pragmatism of much business management scholarship. Adler argued that corporate and global leaders need to adopt a kind of artistic reflectivity in their lives and work, taking time out to let their minds dwell in possibility instead of being anchored in pragmatism. In particular, she urged leaders to reevaluate their corporate goals, considering not only how their actions are benefiting their shareholders, but also how they are helping to make the world a better – and more beautiful – place. If the political and ethical imperative of improvised music lies in its critique of capitalism and its imagining of alternate systems of value and exchange, is it reasonable for corporations to co-opt elements of the performance practice while ignoring the politics? Should improvised music’s politics and ethics be relevant to corporations? Should improvising musicians be expected to adopt a more socio-economically pragmatic approach to politics, ethics, and their own musical practice in order to help make their critique heard? What is reasonable to expect of corporations in terms of social, political, and ethical responsibilities? Is it possible to achieve radical social change without radically changing the structures and epistemologies that undergird capitalism? Special thanks must go to the co-sponsors of the symposium – the College of Management and Economics, the Department of Philosophy, and the Macdonald Stewart Art Centre at the University of Guelph, and Social Innovation Generation at the University of Waterloo – as well as to the graduate student moderators – Rita Hansen Sterne from CME, and David Lee, Nicholas Loess, and Paul Watkins, from the School of English and Theatre Studies. In January 2012 ICASP will be launching a new section of our website dedicated to the Oral Histories of Improvising Artists. Oral Histories is a showcase of interviews, performances, and articles by and about improvising musicians, artists, writers and scholars. This new monthly feature, published on ICASP’s website www.improvcommunity.ca, will offer an intimate look inside the minds and practices of some of the many dynamic, innovative people whose energy and ideas make Improvisation Studies such a vibrant field of inquiry. Over the coming year, witness conversations with musicians including Dave Clark, Tanya Tagaq, William Parker and Amiri Baraka, writer Cecil Foster, and scholars from fields as diverse as legal studies and musicology. The conversations and musical performances of this diverse group, drawn from ICASP’s online Research Collection in Improvisation Studies, are sure to inspire and to enlighten. They are also fun in their own right. If gender is a kind of a doing, an incessant activity performed, in part, without one’s knowing and without one’s willing, it is not for that reason automatic or mechanical. On the contrary, it is a practice of improvisation within a sense of constraint. Judith Butler is an American post-structuralist philosopher, who has immensely contributed to the fields of feminism, queer theory, and ethics. She is a professor in the Rhetoric and Comparative Literature departments at Berkeley. 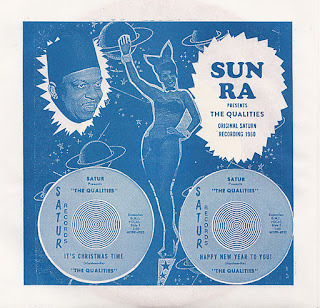 Sun Ra with the Qualities, "It's Christmas Time" and "Happy New Year to You!" This month’s featured Artist profile is actually more of a featured record précis of an incredibly rare record—like all of Sun Ra’s original records are. The Qualities appear on this record as an unidentified male quartet with Sun Ra on the harmonium. There are also unidentified players playing ad hoc bells and wood blocks. Both “Happy New Year to You!” and “It’s Christmas Time” appear on this 1956 45rpm single, produced by Sun Ra and Alton Abraham. The “Satur” in red script along the left side does not appear to be a typo as it appears on both sides, along with “Satur Records presents the Qualities” across the top. Alton Abraham stated that this single was made around a year or so later than the Cosmic Rays recordings and John Gilmore (an American jazz tenor saxophone player best-known for his long tenure as a member of Sun Ra's Arkestra) believes it to be from a rehearsal (held apart from the Arkestra rehearsals) because of the extemporaneous instrumentation. So please—in the spirit of Christmas, whatever that may encompass for you—have a listen (and space out on planetary snowflakes) as ICASP, and Ra, wish you a Merry Christmas, and a Happy New Year! The conference committee invites proposals for lecture-recitals, workshops, panels, roundtable discussions and papers surrounding practice-led research. The deadline for the submissions of proposals is Monday 16th January 2012. We welcome presentations that advance the field of jazz composition, jazz education, the emergence of cross-disciplinary thinking and the development of new jazz scholarship. While we invite proposals on any area of jazz research, preference will be given to topics which accord with the conference’s overarching theme and are presented from perspectives of practice-led research. The deadline for submissions is Monday 16th January 2012, and decisions will be notified shortly after this date. Click here for more detailed information and guidelines. ICASP is proud to announce that our Improvisation and Pedagogy Coordinator and Co-investigator, George Lewis, has been announced as one of the United States Walker Fellows for 2011. George Lewis is a composer, trombonist, improviser, educator, and a pioneer of computer music. Lewis has been a member of the Association for the Advancement of Creative Musicians (AACM) since 1971, and studied at its school under USA Prudential Fellow Muhal Richards Abrams. Lewis’s work with musicians from Count Basie to John Zorn is documented in over 140 recordings. He has also created and performed with interactive computer systems since the late 1970s and has collaborated with visual artists, roboticists, and turntablists in sound installations. He is the Edwin H. Case Professor of American Music at Columbia University and won a MacArthur Fellowship in 2002.